I have an oak bookcase (I hate oak) just hanging out in my kitchen waiting for me to do something with it. After browsing the internet I found a fun and easy DIY project that can help me with my predicament. The ugly brown thing is the before and the white chic piece is the after. 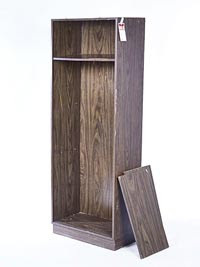 Turning the vertical bookcase on its side transformed it into a clean-lined storage unit. After the frame was stabilized with screws, scratches were filled in with putty. Next, three long partitions and two small shelves were installed to carve out interesting storage nooks. The back of the unit and base were removed, and the unit was propped up on legs made from threaded metal flanges and pipes (I may forget the pipe thing and find something else.) Finally, the piece was painted a high-gloss white.